Do you need to get duplicate car keys made? If so, take our advice and don’t wait. Getting a duplicate car key made as soon as possible can save you time and money. At All Locks and Doors we make duplicate car keys for nearly every automobile make, year, and model. When you have a car key in hand, here are the steps to take to get the best price for your duplicate car keys. Decline service from anyone who quotes you a really low figure (e.g., “$15 and up”). This is nearly always a bait-and-switch tactic. The price to get duplicate car keys (key blanks) online typically runs anywhere from $10 to $130 (depending on the year, make, model and what type of key). Remote head keys, for example, can even cost a bit more. However, let’s look at a 2005 Honda Accord as an example. This car comes with a Remote Head Key only. The average price for a duplicate car key (laser cut remote head key) for this car (2005 Honda Accord) typically costs anywhere from $16 – $70 (depending on whether you get a knock-off or original). 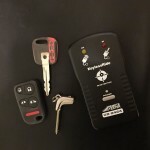 The cost to get an automotive locksmith to come out to your location and cut and program your duplicate car key typically runs around $80-$120. When calling a locksmith to come out and make duplicate car keys for you (same example, for a 2005 Honda Accord), assuming the locksmith provides BOTH the key and the cutting/programming, the cost should run around $160-$200. Therefore, if you order the key yourself, you can save anywhere from 10 – 60% off the cost of your duplicate car key. As long as you purchase a good car key (quality, working) then you can save money by getting the duplicate car keys yourself. So now you know the steps to take to get duplicate car keys when you still have your original car key. But, what if you just lost your last (and only) car key and you are left without any key for your car? No worries. Give us a call now. We have most car key blanks in stock and can get your car keys duplicated and programmed for you quickly and efficiently. We realize how important our vehicles are to us these days. So, just think about it? It’s much less expensive and less stressful to get a duplicate made of your car keys while you still have a working copy (or the original key). We realize that this is something that we all tend to procrastinate – but the alternative is REALLY no fun. Should we lose ALL of our car keys, we not only have to pay more to purchase a new one, we are also left stranded without the use of our car. Even being without a car for an hour or so in this fast-paced life can seem like an eternity. And in the greater Bay Area, unless your life activities are focused in a small urban area or near one of the BART lines, not having a car is not an option. Although many of us may prefer a slower lifestyle that could accommodate slower modes of transportation (i.e. walking), we must face the reality that here in most of the US, at this moment, we are completely car centric. If you need a new car key (either made-from-scratch or duplicate) give us a call today. All Locks and Doors is your automotive expert providing car locksmith services to the entire Tri-Valley area – Livermore, Pleasanton and Dublin.